WASHINGTON (CNS) — The united front of President Barack Obama and advocates for comprehensive immigration reform has tarnished and taken on an increasingly bitter tinge over deportations. Building on huge increases in U.S. Border Patrol resources that began in the George W. Bush administration, Obama’s Department of Homeland Security and Justice Department ramped up deportations, in part to try to build support for comprehensive reform among politicians who demand tougher enforcement as the price of their votes. An analysis of deportation trends released April 30 by the Migration Policy Institute said that because of a combination of a 1996 law requiring tougher immigration enforcement and changes in policy, procedures and funding, the number of people deported annually has soared in the past 20 years. Also dramatically higher is the number of people who are deported under more formal legal removals, which carry longer-term repercussions and sometimes criminal implications. Nearly 2 million people have been deported in the first five years of the Obama administration, compared with about the same number during the eight years of the Bush administration. He added that this is true even though fewer people are being apprehended near the Mexican border, because fewer people are trying to cross, apparently. Analysts suggest that may be because of increased enforcement as well as the weaker U.S. economy of recent years. “The evidence is pretty compelling that enforcement has been pretty effective,” Rosenblum said. The political effect so far, however, is that although deportations are at record levels and illegal border crossing numbers are down, there’s no hint that the recalcitrant, largely Republican opposition to comprehensive reform has budged a bit. Meanwhile, public outcry has ramped up along with the deportations, as activists focus on families being broken apart and some immigrants losing the chance to ever get legal status. A May 1 protest at Lafayette Park, across the street from the White House, drew hundreds of people carrying signs and chanting “not one more” and other slogans focused on stopping deportations of people with strong family and community ties in the United States and no criminal records. Several people were voluntarily arrested for civil disobedience. Similar actions, focused on a range of immigration-related topics, took place around the country, drawing thousands in several cities. A day earlier, at least 20 anti-deportation activists were arrested when they sat down in a street outside the Capitol, blocking traffic. Similar actions have been taking place around the country. One such client, Virginia resident Catia Paz Alvarez, was being put forward as an example at the May 1 rally. Paz arrived in the U.S. at age 17 from El Salvador. She graduated from high school in the U.S., married, bought a house and has two children, ages 3 and 5, both of whom are U.S. citizens. She works in a department store and is active in her church, said Wadhawan. Paz was twice approved for a stay of deportation, but this year her application was denied. “We’re really worried” that she may be ordered to leave any day, Wadhawan said. The attorney said the denial of Paz’s stay application gave no reason for the change in approach for a long-term resident, with no criminal record and who has citizen children, relatives and an employer who would be hurt by her absence. If Paz had left El Salvador a little more than a year earlier and arrived in the U.S. before turning 16, she would have been eligible for DACA, Deferred Action for Childhood Arrivals, the administration program introduced two years ago, through which young people can seek deferral of deportation. Obama in March instructed Homeland Security Director Jeh Johnson to “do an inventory” of current deportation practices and “see how it can conduct enforcement more humanely within the confines of the law,” as the White House described the request. 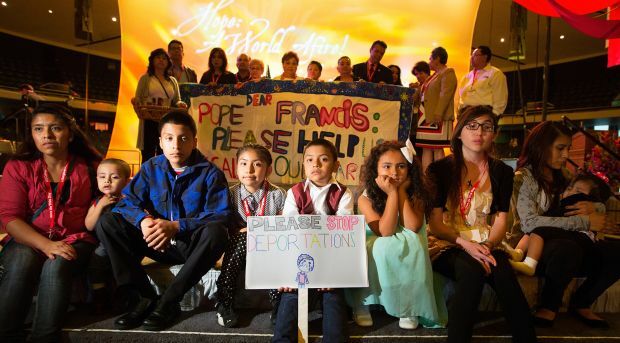 Seattle Auxiliary Bishop Eusebio L. Elizondo, chairman of the U.S. bishops’ migration committee; is among those urging Johnson to adapt Homeland Security policies by focusing on humanitarian implications. Bishop Elizondo also asked Johnson to ensure that people who are deported are not left in dangerous situations, and asked for an expansion of alternatives to detention and “know your rights” presentations for people who are subject to deportation.